Rosie O'Donnell restrained herself from bashing Donald Trump on "The View" this morning, following Trump's rant at O'Donnell after she slammed him for not dethroning troubled Miss USA Tara Conner. Meanwhile, Trump said he is "certainly thinking really strongly" about filing a suit against "The View" co-host. O'Donnell made light of the feud on Thursday's show. She pointed to her wife, Kelli, in the audience and said, "I was afraid to leave her home in case someone with a comb-over came and stole her from me," which prompted wild laughter. She made short comments later, at which the audience laughed. "We'll be back with more 'hot topics,' " she said during a commercial break, "and not the ones you think I'm going to talk about." After the broadcast, Trump phoned into "Good Day LA" and described O'Donnell as a "little clam" because she was tight lipped about the controversy on the show, and added that Barbara Walters "cannot stand" her co-host. "(Rosie's) been a loser for a long time, and extremely unattractive woman both inside and out and, you know, you have to attack people when they attack you, especially when they attack you with lies … I never went bankrupt," he said. "I never went bankrupt. She said that I went bankrupt and I had many friends that did in the early '90s when the real estate market was collapsing. I never went bankrupt, she said I went bankrupt. She's got huge legal liability and she knows it." As for why O'Donnell attacked him in the first place, Trump said, "I think she's very attracted to Miss USA, so I think she wanted to put the crown on her head herself." Trump said the reason O'Donnell hardly mentioned the feud on the show Thursday was, "because I fight back," he said. "Let me tell you something, Barbara Walters is a good friend of mine, she cannot stand Rosie O'Donnell," Trump said, adding that he won't appear on the ABC program again. On Wednesday, O'Donnell took aim at Trump on the talk show after he held a press conference and announced that despite allegations of underage drinking, drug use and sexually explicit behavior, Conner would enter rehab and retain her crown. "And there he is, hair looping, going: 'Everyone deserves a second chance and I'm gonna give her a second chance,' " she said. "He annoys me on a multitude of levels. He's the moral authority? Left the first wife, had an affair; left the second wife, had an affair; had kids both times, but he's the moral compass for 20-year-olds in America?" Never one to back away from a fight, real-estate mogul and co-owner of the Miss Universe Organization, Trump blasted back in an exclusive interview with "Entertainment Tonight" and "The Insider." "Rosie O'Donnell is disgusting, both inside and out," he said. "You take a look at her, she looks like a slob, she talks like a truck driver. She'll say anything that comes to her mind and, you know, her show failed when it was a talk show. The ratings went very low and very bad, and she got essentially thrown off television and, I mean, she's basically a disaster." This isn't the first time that O'Donnell has feuded with other celebrities. She and Kelly Ripa exchanged words on "The View" after O'Donnell said Ripa was homophobic for saying she didn't know where "those hands have been" after Clay Aiken — who refuses to discuss his sexuality — covered her mouth in jest while co-hosting her show, "Live with Regis and Kelly." Recently, many Asian Americans were offended by O'Donnell's imitation of the Chinese language and she apologized on air. But so far, O'Donnell has expressed no remorse for her criticism of Trump. "I just think that this man is sort of like one of those snake-oil salesmen," she said on Wednesday's show. "Coming from Rosie, that's pretty low. Because when you look at her, the mind is weak. I don't see it," Trump said. Trump has also had his share of high-profile conflicts. After Martha Stewart's "Apprentice" spin-off flopped, she and Trump exchanged a few public insults. "When I saw the tape, I said, 'You'd better be careful or I'll send one of my friends over to take your girlfriend!' " Trump told The Daily News. "I imagine it would be pretty easy to take her girlfriend away, considering how Rosie looks." On the show Wednesday, O'Donnell also said that Trump would probably sue her, but he would be bankrupt by the time he gets around to it so she doesn't have to worry. On Wednesday evening, O'Donnell fired back at Trump on her blog. She posted information from Wikipedia, an online encyclopedia, which detailed Trump's bankruptcy woes. "Loving the wiki," she said at the end of the message. "i use it/do u"
"i will let u know if the donald sues me," she continued. "or if kelli (O'Donnell's wife) leaves me for one of his pals/dont u find him charming"
"I think it's very sincere," said Jess Cagle, The Early Show entertainment contributor and People magazine assistant managing editor. 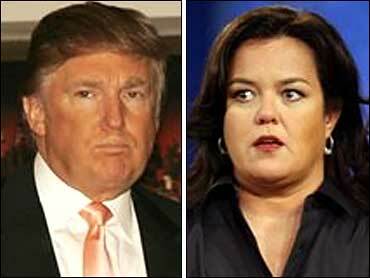 "I don't think either of these people, Rosie or Donald, do anything that is not ultimately in their respective interests. However in this case, they are really angry at each other. That's what makes it a great feud." "We know they are scrappy and will survive," Cagle said. "Nothing would anger Donald Trump more than question his financial well-being," Cagle said. "She hit him where it hurts and he called her fat. You don't hear adults talk like this … what makes it OK is that they are both big kids."